Universal Declaration of Human Rights-Article 1. This is one of my favorite actresses that appeared in the Egyptian movie industry. 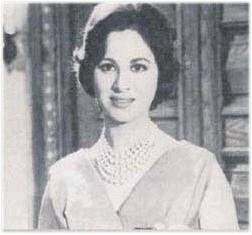 Faten Hamama for me represents the elegant intelligent beauty and talent versus today's vulgarity and distaste. I learned few days ago that a website in English and Arabic was built for her. Thought of sharing it with you. It is so surprising to see how women in Egypt in the 30's and 40's and 50's so modern versus the today's waves of Islamization. In the last photo Faten Hamama received an award surrounded by some of her colleagues. I love the old school actors and actresses in the American cinema. It is true that movies lacked the realism of today's cinema, but there stylistically things about yesterday's actors that today's bunch just don't possess. Can I ask a question to all Islamists out there? Issa, if you're there, I need an answer please. Did Egyptian men all of a sudden become a lot more sexual in the last decade or two to warrant the Islamists' call for burqa/hijab?????? 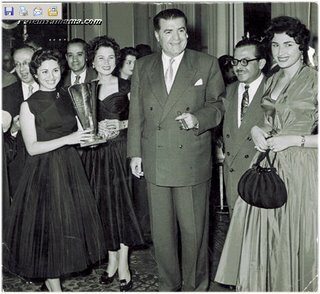 Were there mass rapes in Egypt back in the 40's because Egyptian women were walking around "naked?" Did the Islamists start tainting the water supply with testosterone to make Egyptian men more horny so that they can impose the burqa/hijab? 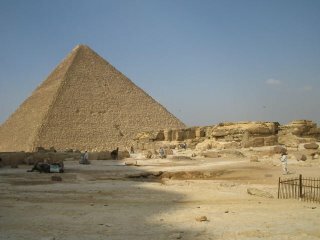 It really pisses me off when I see pictures of progressive Egypt....70 years ago!!!!!! Why on earth are you involving Islamization as it is some kind of an ideology!! Hijab is not a uniform or a sign, it is practising the religion. Islam and modernization are possible..look at Turkey! wearing Hijab will not hold the country back but only ignorence of blaming Islam of how Egypt status is. The actors were well dressed because we were invaded by Europeans and had influence on us. It might look nice but this is not Egyptian.Btw you talk like it is compulsary for Egyptian women to wear a Hijab on the streets..which is not true!! Even the Muslim Brotherhood said that they will not pass allow that restricts women's clothe.Why are you saying Islam has influence in fashion? there is no law in Egypt that says women should wear Hijab nor women should not have any sense of fashion..Blame your self for ignorence home girl! Freedom and Democracy are the only guarantees for human dignity, self-respect and human rights.